Les Diablerets, un villaggio tradizionale, offre sci a 3000m (inclusa l'estate) escursioni / passeggiate, tennis, nuoto e golf in estate. uno chalet di 3 piani in un giardino soleggiato. 3 camere da letto, 1 bagno, 1 doccia, cucina, sala da pranzo e soggiorno con caminetto. Ci sono 2 balconi e una terrazza. Doppio garage ha deposito sci. Dettagli del resort: Lo chalet è di 1 ora e 1/2 (strada o ferrovia) da Ginevra. 12 ore in auto da Londra. Centro di 3 regioni sciistiche tra Gstaad e Villars. Più di 50 impianti di risalita nelle vicinanze, tutte le scuole di sci standard. Principianti / bambini di esperti neri scappano da Glacier e Villars. Il Ghiacciaio Diablerets (ascensore a 2 km da Chalet) è aperto tutta l'estate a 3000 metri. Cross country e discesa. Parapendio, tennis, nuoto e golf (7 percorsi in 1 ora). L'acqua calda è limitato in tutti gli chalet svizzeri. Abbiamo una particolarmente grande serbatoio di acqua calda di 300 litri, che a causa di normative locali è riscaldata solo di notte. Questo è sufficiente per le esigenze di lavaggio giornaliero per 6 adulti. Chalet Royal dispone di un bagno: bagno con doccia oltre e con WC Una doccia separata al piano superiore Un WC separato al piano terra. La sistemazione è su tre piani composto da una metà di una villetta. Lo chalet è stato costruito per l'uso da parte di Swiss locale ed è finito a un livello notevolmente superiore vacanze normale. Con 125mq o 1300 piedi quadrati all'interno di un giardino di 1.000 mq (11.000 piedi quadrati), un enorme doppio garage e parcheggio fuori strada per due auto, vi è abbondanza di spazio per tutti. Costruito sul versante esposto a sud e soleggiata sopra il centro del paese, lo chalet è ben separata da chalet circostanti. I panorami sono spettacolari, fino al ghiacciaio Diablerets e in tutta la valle per l'area sciistica Meilleret / Villars. L'accesso al centro del paese e le varie aree sciistiche è disponibile per coloro che non hanno auto tramite un servizio di autobus locale gratuito. Una fermata dell'autobus è a meno di 100 metri dallo chalet. Le chalet est situé à l’ecart des Diablerets sur la route menant au Col du Pillon. Il est préférable d’avoir une voiture car les navettes ne fonctionnent qu’en journée jusqu’a 17:30. C’est un demi chalet de deco rustique, très montagnard, sur 3 niveaux, avec 3 grandes chambres, ce qui offre de l’espace à chacun. Une des 2 salles de bain en revanche n’est pas fermée et ne comporte qu’une douche, ce qui n’est pas pratique. Le wifi est excellent, la smart tv tres pratique et la cheminée très agréable. Seul bémol, la cuisine avec trop peu de lumière, un tout petit réfrigérateur, et un évier bouché. Dans l’ensemble idéal pour une bonne semaine de repos. Cosy, 70s style, family chalet. Five of us spent a lovely week in this cosy, unostentatious, family chalet, situated about 5 minutes by car (15 minutes walking) to the centre of the village. Chalet was clean, sunny and warm. Nice to have an open fire and also the use of a large garage so we could keep the skiis on the roof of car. Chalet would be a comfortable fit for 6 adults and is a reasonable price for high season, in that location. There was very little snow during our stay but about three runs were open on the glacier and three in Villars so a car is advised, as the owner says. Quickest way to Villars is over the Col de la Croix. (Officially closed in winter but check with someone in the know. A 4x 4 is advisable.) Communication good and very prompt. We walked around Lake Retaud then on up to the Restaurant Marneche at top of gondola lift from Les Diablerets. Had good hamburgers for 10 Chf each on panoramic terrace. Had delicious pizzas in restaurant close to Coop. Without exception we encountered, polite, professional, helpful people. Everything is fantastically well organised in Switzerland and fantastically expensive too! Visit to Lavey les Bains outdoor thermal baths is a must. Recycling is a big thing in Switzerland so sorting rubbish is important. (Tip: yellow 17 L rubbish only bags can be purchased individually from the tourist information office for 1Chf). Tourist office extremely helpful re: different lift passes and places to go as was Holiday ski with all our equipment. (Tip: if you can't make it back to chalet in time, public loos in village are situated down the outside stairs at Maison de Commune! We rented a 4 x 4 through Thrifty (Hertz) in arrival terminal at Geneva airport (Swiss side, to save hassle). Good car, straight forward transaction and easy shuttle to the underground parking for rental cars. Easy journey to Les Diablerets on motorway then mountain road from Aigle. Equally, easy to get there by rail from airport via Aigle. Great six days. Would definitely go to the Chalet Royal again. We are pleased you enjoyed your stay at Chalet Royal we have spent many summers and winters in the chalet with our children and grand children enjoying the wonderful scenery, sport and of course alpine air. You are welcome back anytime! Chalet Royal is a pretty and cosy chalet although conveniently spacious, surrounded by extraordinary landscapes and views. I felt privileged to be able to stay here with my family, with easy access to the village while still serving as a relaxing and calming getaway from our busy lives. Usually we come to Switzerland in the winter when we ski, however, this summer holiday was definitely the best I've ever had! There was so much to do; swimming (outdoors and indoors), playing tennis on the clay courts, archery, mini-golf/golf and hiking, which we all managed to do in just one week! - And of course there was more. I can't wait to be welcomed once more by this secret retreat this winter and perhaps next summer too! The two weeks flew by and we still didn't visit everything on our list... The Chalet is very clean and homely, the location excellent and we visited Gstaad, Villars, Leysin and Aigle during our stay. The Skiing on Isenau and Villars was super and we managed to go up onto the Glacier for the first time this year as the children were able to ski on the top. Thankyou for your kind remarks. fantastic chalet, spacious and very comfortable, ideally situated and very clean. 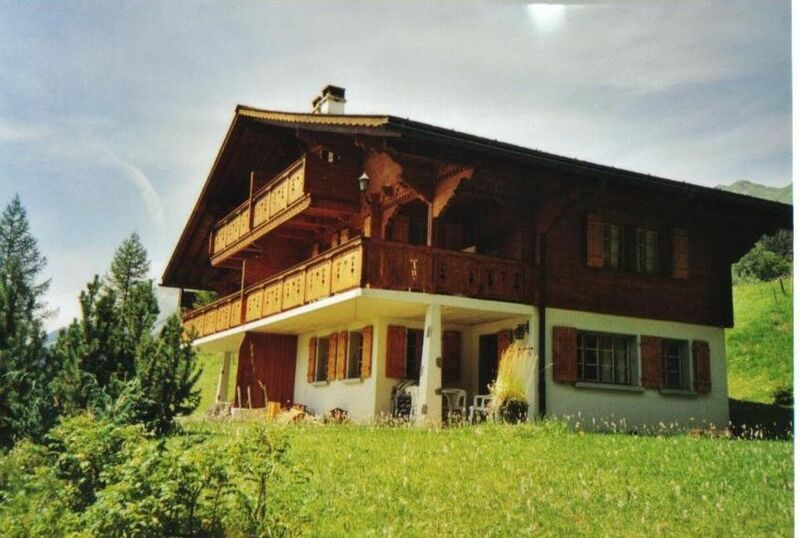 Large chalet and friendly quiet village. The children had great rooms and we had a lovely romantic room on the top with private balcony. Per famiglie villaggio di montagna svizzero tranquilla e incontaminata ricca di chalet tradizionali. Gamma di ristoranti locali e negozi di alimentari a Les Diablerets in base alle tradizioni di una comunità agricola eco friendly. Per ulteriori informazioni, non esitate a contattare il proprietario. Sci: 3 aree principali Isenau fino a 2120m, Meilleret (legata Villars) fino a 2120m e 3000m ghiacciaio di Les Diablerets. Tutte le zone collegate da skibus gratuito. Prices include all linen, towels, electricity etc,Swiss tourist tax & Final Cleaning on Departure of the property. NB: does not include Firewood or Telephone.